The family of Shirley Doreen Terejko wishes to announce her passing on Saturday, April 6, 2019. Shirley passed away peacefully at the Brantford General Hospital and was in her 89th year. She is predeceased by her husband Joseph Theodore Terejko (May 2, 2010). Shirley is survived by her son Joe (Mary) and their children Matthew (Valerie), Benjamin, Rachael (Shane) Thompson, Emily, Rebecca, James, Hannah, Madelin, Gabriella, Josiah, Simon and Noah and great-grandchildren Bo, Addeleen and Charlotte and daughter Karen Boisclair (Stephen) and their children Nevada and Tera. 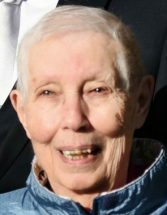 Shirley was an active member and supporter in Beta Sigma Phi Sorority, the Brant Figure Skating Club and competitive swimming in Brantford. Most of her working career in Brantford was spent as a secretary with the Board of Education and she spent 22 years at Dufferin School. Cremation has taken place with a private family celebration of life.